Update! The makings of a team are coming together. 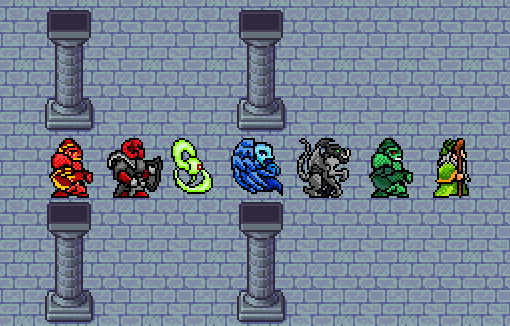 Playing around with Golems this afternoon. Very intrigued by the Nightmare Golem! I've discovered Moon Hunters! Might add two to the team to exploit their synergy. Hello, All! 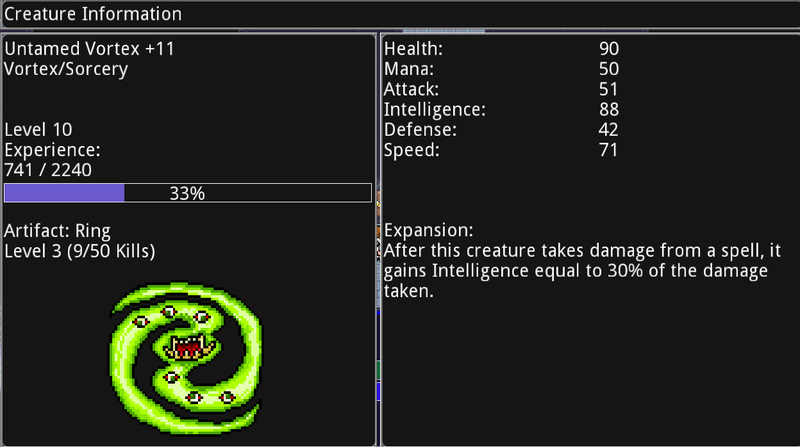 I'm a new player to Siralim. I've been eyeing the original on Steam and the Android store for a good long while now. As an avid player of the original Pokemon and other such games, the party building focus and deep customization really appealed to me. But I never actually pulled the trigger until seeing the sequel's release on Steam yesterday. Now I'm hooked! Right now my focus is all about experimenting, learning about the spectrum of possibilities present and what works for me. I'm really avoiding fixating on a single party or tactic and instead rotating my group more or less any time I have the brimstone to summon and the energy to breed. I try to develop parties for tackling the different sigils I come across: this encourages different playstyles and affords me interesting battles across the spectrum of levels. I've also focused on breeding, too, for the long term power games it promises. Here's what I've found thus far. My first favorite creature was the Fallen Carnage. Its Midnight Feast ability to completely heal and repeat its turn every time it nets a kill is fantastic. Slap Berserk on via a spell and it becomes a one-creature wrecking crew. Lately I've been toying with breeding and looking for spell caster. The fruits of these labors thus far has been an Untamed Vortex +11. I'm not sure if I like its mechanic better than the Mana Vortex - the Untamed is a bit more boom or bust - but it's worth trying out. I could always breed it with a Mana Vortex if I turn out preferring that creature. 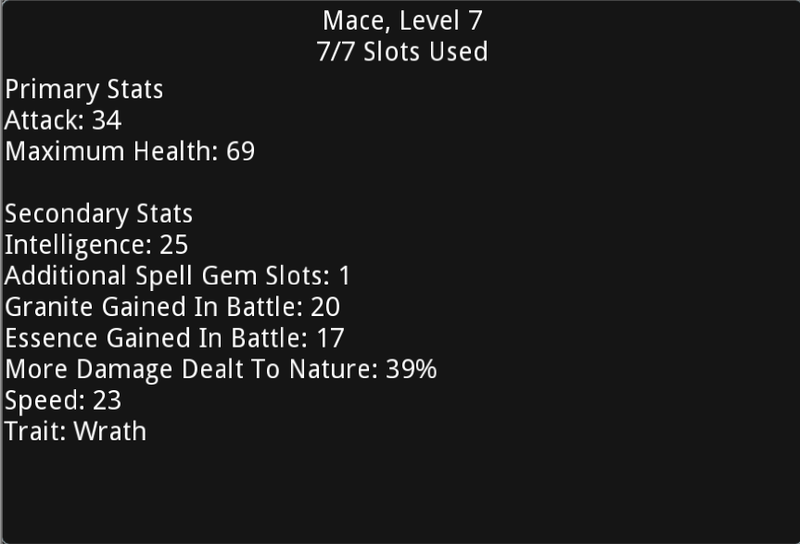 Notable finds that I'm building around are a Mace with Wrath (grants Multistrike) as well as solid stat bonuses, a rune that grants an additional attack for Multistrike (about to try this combo out on my Fallen Carnage! 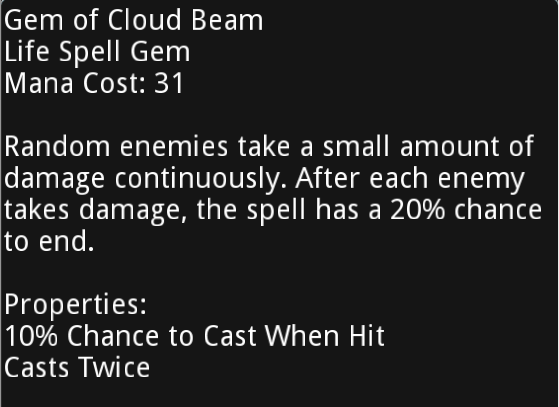 ), and a Gem of Cloud Beam that casts twice and has a chance to cast when hit. The last is great for softening up creatures to extract cores or be finished off by my Fallen Carnage. I'm off to do some more experimenting. I'll be curious to see what of the above holds in future parties! Finally feel as though I have the foundations of a team going: Regal Golem, Chaos Guard, Untamed Vortex, Siren Oracle, Fallen Carnage, Nightmare Golem. Both Golems' abilities are fantastic, the Regal for healing and the Nightmare for crowd control at the start of a fight. I've a rune that gives 50% chance that sleeping enemies don't away when they take damage, which makes the Nightmare Golem all the more effective. I actually tried running two Regal Golems for max healing, but speed was an issue even if I mitigated it with artifacts. Might return to that approach later on or swap the Nightmare for a second Regal just to see how the extra healing plays out. I've a thing for Golems; still have a few other versions to discover. The Chaos Guard is a great defender with its straight 25% less damage for allies ability, and makes a decent secondary caster, too, with some solid Chaos spells. The Siren Oracle is a great Life caster (double casting Cloud Beam! ), and its ability to inflict Scorn or Silence with an attack means it still has value when not casting. I'm not convinced the Untamied Vortex will remain long term, but it's filling a slot admirably enough for now. Need some kind of caster in there, but perhaps something with an ability that better benefits the entire group.